I am also thinking if someone has basic info about you, such as your email address, they can get their hands on your computer and start auto-filling out all kinds of forms without your knowledge. Fortunately, it’s a quick fix. Thank you very much for explaining autocomplete. Web forms have not changed much since the 90’s. Autocomplete, in its current state, is not a welcome change. That is really an informative article. Thanks for sharing this stuff with us. I just deactivated the autofill option to stay on the safe side. Thanks for the sharing information alike. Its really so productive as well as this website. I am so Happy!!! This is really good. I did not fully understand the pitfalls of not shutting off autocomplete. Thanks for sharing. I just done it . Safari 7 (at least with Mavericks) is much smarter about this. It actually showed me a popup of all the info it was about to fill in and wanted to know if I was really really sure I wanted to give away all that information. Given that, I’m leaving auto-complete on. I am 100% agree with you but before reading this article my opinion was really negative. I’m with you! I’ve been an advocate of RoboForm (and the others now available like LastPass and KeePass) for many years. In a world of so many spies, I want to control at least some of my info! does incognito mode in chrome still works for autocomplete? I just checked on Safari (OS X Mavericks) and it alerts me what information is going to be sent. I guess taking that extra minute to fill a form by yourself seems legit now! This apparently doesn’t happen on Safari 7 with Mavericks. I hit tab to invoke the auto complete prompt, and none of the other fields are filled except for the one. The term “autocomplete” is misleading. The values that go into autocomplete fields come from the server and not your browser. It’s what is used for Google search etc. What you/Matt Cutts are talking about is AutoFill, which is indeed something you shouldn’t use. Thank you for posting this Yoast. 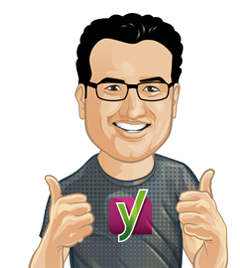 Thank you for posting this Yoast. I had no idea autofill could be so open to abuse. I’ll be making sure to tell everyone I know about it and sending them on to this post. Okay, till this time i was thinking chrome was only filling up few details that were asked, but if somehow some spammy or malicious sites get our personal or financial data.. it will be completely our fault..
After knowing this I’m done with auto-complete..
Autocomplete is a useful but dangerous feature . Yes, I got the same problem in Firefox. Good thing I am not fun of using autocomplete button. I always turn it off when it shows up! Sorry guys, this question is not related to this post. Unfortunately, comments are closed on the other post. And please bear with someone who is a beginner among you experts. I use ProPhoto, and I see two .htaccess files. One is in www directory and other is in public_html. Where do I add the redirect code, or does it need to be in both places? since I was switching from “day and name” to “post name”. With Chrome’s developer tools, you can reveal the hidden form fields on the sample form and see how they are being populated, without even submitting the form to Yoast. I tried it out, and although my credit card information is stored in Chrome, I found that the form would not autopopulate the credit card fields, unless I actually used autocomplete on the cc-number, cc-exp-month, or cc-exp fields. And when you do that, Chrome pops up its dropdown with the credit card logo, so you know that it is happening. In short, I don’t think that you have demonstrated that this technique can be used to steal credit card information without your knowledge. On the other hand, it is able to grab other information such as full name, physical address, and email address. Although the sample form didn’t include telephone, I was able to twiddle it to see that it could grab that as well. Yak, that is really scary. The same issue perfectly working in firefox latest version browser as well, while pentesting some applications. Thanks for alerting. Removed the feature from chrome right away. This feature has been known to not have any security for years. Stuff is just kept in plain text files. Find a 3rd party alternative like Last Pass or something that encrypts your information if you want auto-complete. I’d rather pay attention to what info I’m giving someone anyway. PS: I like to see micro posts. I use Firefox and it only entered my name? Is that ok, I didn’t even know what auto complete was, I was told by an IT security person to use Firefox over any other browser.. Thanks for the info. Will share your website link on our Facebook page for others to know. Thoughts on just curating your auto-complete? I just went into settings and you can manage every entry and delete them. I never save credit cards and never will, with properly curated addresses all they can get are your phone number or email, which doesn’t bother me since I can block spam. Unless I’m missing something major. Or manage your auto-complete entries and make sure anything you don’t want revealed (Like a credit card) is not saved. Click Show advanced settings and find the “Passwords and forms” section. Thank you, Joost! I always had bad feeling about auto-complete and never had it turned on for me. Thanks for the great tip Yoast. Just what I’ve entered. Got autocomplete on. @Brian, not everything’s a tradeoff. It’s a matter of being consciouss about your privacy, and the motivation of big, commercial companies to gather as much information about you and me as possible. To deal with this growing danger, luckily there are options to choose from.. And these options are a lot more than just choosing between autocomplete or manually typing in our info. So I guess this also goes for services like Lastpass.com and the like? I assume their “fill form” feature will fill in the hidden fields just as well? I wonder if there’s a way for autocomplete to check if a field is visible or deliberately hidden and either alert the user, or be set to never fill those fields in? I suppose the only way you could be sure is to turn it off completely. I found this over on the lastpass forums. “We make an effort to avoid filling into hidden fields, but it could be possible for a site to use advanced CSS techniques to end up with a field that is technically visible, but (for example) is rendered off the screen. Thanks Dean and Wayne, that’s good info. The convenience of autocomplete isn’t worth the potential consequences, so off it goes. Yoast his advice is valid, turn off autocomplete. And think before you do. Crap! I never knew this, but I always turn off autofill, never remember passwords etc. and the like. Everything’s a tradeoff. If you do use autocomplete, keyloggers won’t capture what you entered. Isn’t someone more likely to use this technique to get your information than get a keylogger on your system? Very interesting point, Brian. Never thought about that. But it’s much harder to install a keylogger on a users machine than it is to take some free data that the browser is posting to you. This new feature seems dangerous indeed. Thanks for the information, I just desactivated it. I personally use lastpass to fill forms, like that I don’t have to type everything again, but I can still control what happens.